Happy Valentine's Day (Tuesday, February 14th) Everyone! The caper film first laid its roots in The Asphalt Jungle previously recommended here. The depth of its characters and their fascinating interactions as the drama builds to a cathartic resolution is why this film has become one of America's finest cinematic achievements. The 'best laid plans' will begin on TCM Wednesday, February 1 at 2:30am PST. 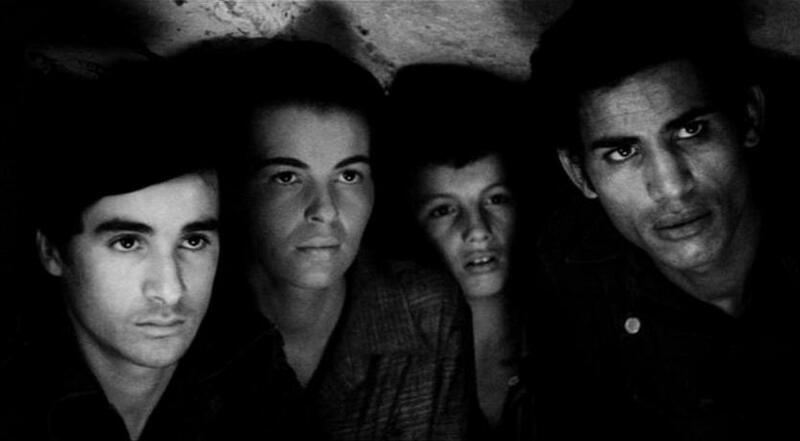 One of the Top Ten World Cinema Treasures is The Battle of Algiers a.k.a. La battaglia di Algeri. The intensity of resolve and emotional dedication is so resolute on both sides of the conflict portrayed, it'll take a miracle for the invested viewer to fully recover after witnessing this stunning cinematic spectacle. The battle will commence Thursday, February 2 at (late evening) 12:30am PST. My next TCM recommendation has been previously reviewed here and is the story of Bonnie and Clyde only re-imagined as the mythical romantic exploits of an impossibly gorgeous but infamous couple in crime. The Barrow Gang will strike on TCM Friday, February 3 at (late evening) 1:15am PST. Many readers have taken me to task for my inclusion of Casablanca on a list of Top Ten Fools Gold: The Overrated. I would simply ask that they read what I wrote about this revered classic before judging me too harshly. There is much to praise about the film contained in my review and the weaknesses I've discovered are, I feel, worthy of consideration. In any event, please indulge in this motion picture's magic and then let me know if my criticisms have value. The journey begins Sunday, February 5 at 5pm PST. Later that same evening is another Top Ten World Cinema Treasure, an American film classic, previously recommended here and one that I can find no fault with, Citizen Kane. He will attempt to win your vote Sunday, February 5 at 9:15pm PST. Then there's Gold Diggers of 1933, a brilliant extravaganza of romance, comedy, catchy tunes, and outrageous pre-code show numbers especially 'Pettin' in the Park' with its saucy sexual undertones that even Freud would have struggled to explain. This is another previous recommendation here. The fun will begin Thursday, February 9 at 7:15pm PST. What better way to honour the recently departed director Robert Ellis Miller than by watching his most sublime and emotionally impactful work, The Heart is a Lonely Hunter, previously praised here. Miller's heart will continue to warmly beat on Sunday, February 12 at (early morning) 3am PST. Also on this month is a well-known adventure-thriller I'm not as strongly thrilled about recommending for reasons explained here. In the end, it does have enough spirit and technical bravado to sustain one's engagement and deserves to be seen at least once. Steven Spielberg's Jaws will open wide Monday, February 13 at 7:15pm PST. By the title alone, first time viewers would expect the prospect of watching Kind Lady (1951) to be about as exciting as washing dishes. How wrong they would be! Kind Lady even starts out blandly focused on the benevolent title character, played with assuredness by Ethel Barrymore and her interactions with a gentlemanly painter and art admirer Maurice Evans (perfectly cast in his Hollywood motion picture debut). But Evans is not who he seems and when he does show his true colours, they're of the sinister, dark variety. He terrifyingly takes full advantage of Barrymore's hospitality to the nth degree and along with his con-artist cohorts Keenan Wynn, Angela Lansbury and Betsy Blair, makes Barrymore prisoner in her own home for substantial personal gain. This is a nail-bitingly intense Edwardian period thriller since, for one thing, Evans is willing to do whatever it takes without hesitation, even commit murder, for his scheme to succeed. It has been most competently directed by John (The Magnificent Seven) Sturges, no stranger to well-made films noir such as The Sign of the Ram and Mystery Street. The film originates from a stage play by Edward Chodoroy (a previous film adaptation was released in 1935) that gives the proceedings a feel of confinement, heightening its perilous ambiance and ratcheting up the suspense. The kind lady along with her anything but kind home invaders will reveal themselves (updated) Saturday, August 19 at 11am PST. The Lost Weekend, previously reviewed here, is Billy Wilder's portrayal of a writer's struggle with his addiction to alcohol. There's a powerhouse performance by Ray Milland at the film's centre as Don Birnam, whose desire (one of several) is to put his harrowing experiences down in the form of a novel, 'The Bottle'. Don's chosen literary title symbolises both extremes: His compulsive desire for poisonous ruin on the one hand and a personal salvation from those same formidable self-loathing actions on the other. Both types of "bottles" will be found on TCM Wednesday, February 15 at 5pm PST. MGM's 1952 musical Singin' in the Rain was not adapted from a stage production, though the film was later turned into one, being first presented on stage in 1983. Its abundant creativity, innovation and driving energy place this film at the top of all cinematic musicals ever produced. Singin' in the Rain has been reviewed as a past Blu-ray selection here and will joyously dance its way onto TCM Friday, February 24 at 11am PST. John Huston's The Treasure of the Sierra Madre is indeed an unforgettable American treasure and a prior TCM recommendation here. Its cinematic storytelling riches can be uncovered on TCM Tuesday, February 28 at 5pm PST. This month's Happy Birthday shout-out goes to the fabulous Kim Novak who turns 84 on February 13th. An agent discovered the radiant beauty waiting in line to be cast as an extra. She was given a screen test, took some acting lessons, and made her film debut in the excellent film noir Pushover co-starring Fred MacMurray. There followed the comedy Phffft with Jack Lemmon and Judy Holliday, another notable film noir 5 Against the House, the controversial Otto Preminger directed The Man with the Golden Arm, and her breakthrough film Picnic. She more than held her own with co-stars Frank Sinatra and Rita Hayworth in the hit Pal Joey. In 1958 Kim appeared in what is today her most prestigious motion picture role in Alfred Hitchcock's Vertigo. She was also paired with Vertigo's star Jimmy Stewart in 1958's supernatural romantic comedy Bell, Book and Candle, starred with Fredric March in the following year's underrated Middle of the Night, and in 1960 was paired with Kirk Douglas in the even more underrated romantic drama Strangers When We Meet. February's Soundtrack recommendation is to The Red Pony and The Heiress both composed by one of America's most recognised and distinguished classical compositional composers, Aaron Copland. Noted for his expansive, highly descriptive and attractively changing harmonies, Copland became synonymous with American music. His most recognised classical works include Appalachian Spring, Billy the Kid, Rodeo, Fanfare for the Common Man and his Third Symphony. Both of the fabulous film scores presented here are the original soundtrack masters conducted by the composer himself, taken from the Paramount Pictures Scoring Stage, and make their premiere on this landmark Intrada CD. This is a limited release so act fast. For more information, including ordering, click on the accompanying image. There is a fascinating 1980 interview with Aaron Copland who spoke with Roger Hall about his film scoring endeavours that one can read by clicking on the composer's picture. The Blu-ray recommendation this month is, along with 1967's Point Blank, and Britain's 1971 version of Get Carter, one of the finest crime and neo-noir films to emerge since the film-noir classic time period ended in 1959, The Friends of Eddie Coyle released in 1973. Robert Mitchum, in one of his last great opportunities to shine, has dug deep to convey all the washed-up honesty behind what is perhaps the most realistic and yet sympathetic of all over-the-hill crime figures ever to appear on the silver screen, Boston's Eddie 'Fingers' Coyle. Aging career offender Eddie is looking at another prison sentence unless he cooperates with the Feds and gives up his so-called "friends". Meanwhile, in order to make ends meet, his own criminal activities continue, meaning he must attempt to cunningly play both sides against one another to come out unscathed, which at the rock bottom of this dog eat dog, low life pile-up, is a practical impossibility. The Friends of Eddie Coyle provides a penetrating combination of gritty crime thriller with a tragic, deeply felt psychological character study. Those who were familiar with director Peter Yates' past on-location work in this milieu (Robbery, Bullitt), figured this most competent craftsman could deliver the first part but were thankfully surprised when here, he so engagingly gave us the second. There's no glamour, no glory with Eddie or his friends, just cold bitter reality presented in an almost docudrama fashion. Still, this under-appreciated gem excites and fascinates, offering innumerable insights into the dark world of a desperate criminal enterprise care of Paul Monash's expert adapted screenplay of George V. Higgins' vividly authentic novel, and a stellar supporting cast including Peter Boyle, Richard Jordan, Steven Keats, Alex Rocco, and Joe Santos. There are 2 fine transfers to choose from. That choice will probably depend on where one resides. The first is from Criterion (for North America) and is region A locked. The second is a region B (locked) Blu-Ray (with DVD combo-pack), compatible for the U.K., Europe, and Australia. It has become available from Masters of Cinema. More information including ordering from Amazon U.S. (top) and Amazon U.K. (bottom) can be obtained by clicking of either of their respective images.